I’m inbetween pets right now, but I noticed the CAM and animal care trend a while back. It makes sense, as there’s a big overlap among users of complementary and alternative medicine and animal lovers. Maybe that’s because animal lovers are natural caregivers? Or because aging cats and dogs need chronic pain treatment as much as people do? 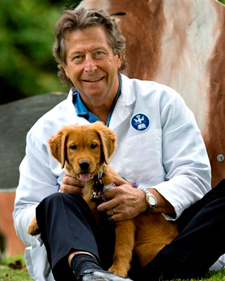 Whole Living advisory board member Nicholas Dodsman, DVM (shown here) just edited a book called Good Old Dog: Expert Advice for Keeping Your Aging Dog Happy, Healthy, and Comfortable. And today, USA TODAY features a piece about vets integrating holistic treatments into animal care, which makes it official: CAM in the vet’s office is mainstream. Wouldn’t it be wonderful if more doctors attended mindful communication medical conferences like the one described by Pauline Chen, MD in the Well Blog this week? Reading about how mindfulness training benefits doctors and the patients they treat, I’m reminded of a patient empowerment feature I worked on for Whole Living. “The Best Medicine: How To Find A Doctor You Trust” may be one of my all time favorites. I met each of the physicians photographed—Dr Pat Allen, Dr Benjamin Asher, Dr Richard Ash and Dr Susan Blum–at the photo shoot, and they were thoughtful and in-the-moment. Did you see Aasif Mandvi’s Daily Show spoof on evidence based medicine and science this week? Watch “Science: What’s It Up To?’ for a good chuckle. In the blogosphere, Joseph Nowinski, PhD calls for a rethinking of palliative care, a term used to describe care for symptoms and stress related to serious illness. The Huff Po blogger has argued that we’d be better off if cancer survivors were offered CAM therapies such as yoga and acupuncture along with rehab as part of comprehensive care, because many can relieve stress and pain. Here, he goes even further and suggests that regular stress reduction may help reduce the risk of developing cancer in the first place. Amen to that. I had every intention to read the story on the “Forks Over Knives” screening for Congress when I clicked through Jeffrey Bland’s post. But once I landed on one green planet, I was sucked into the item on Vegan Halloween goodies. 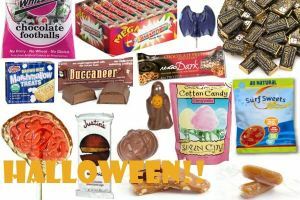 Buccaneer candy bars—who knew? Maybe if our politicians take the movie to heart, pop a few gummy bears and read Inc’s “Sit. Breathe. Be A Better Leader” and start meditating, we’ll get out of this mess. Welcome to the world of alternahealthgrrrl, a spinoff of the Holistic Health Headlines blog I created while I was the senior health and nutrition editor for Whole Living , a Martha Stewart publication. Come back to read about the latest news and developments in integrative and mind/body medicine and what it means for you.